Paso Robles police have begun arresting homeless individuals who are not complying with the city’s order to evacuate their encampments along the Salinas River. 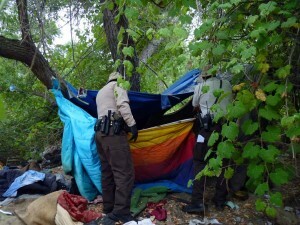 On Tuesday, officers arrested five homeless people for camping and another one for having an outstanding warrant. Last week, Paso Robles city employees began kicking the homeless out of riverbed encampments in preparation for heavy rain that arrived over the weekend. Officials say it is too dangerous for the homeless to be living in the area, and the city has a zero-tolerance stance on riverbed encampments. City workers identified 46 river encampments last week, 24 of which were occupied, according to a city press release. Paso Robles employees made contacts with at least one resident in each of the active encampments. Since then, some of the homeless have complied with the city’s evacuation notice while others have been resistant. The city set a deadline of Thursday for the homeless to remove their property from the encampments. Police officers are continuing to speak with the riverbed residents. In addition to making six arrests on Tuesday, officers also issued five citations for delays in evacuating. Paso Robles City Manager Tom Frutchey released a statement defending the city’s decision to arrest the homeless. Police Lieutenant Ty Lewis said it is unfortunate police must resort to making arrests. But, the city is left with few options because some of the homeless remain intent on camping in the riverbed despite being repeatedly warned of the dangers, Lewis said. The city is working with local homeless services providers in attempt to resolve the homeless “crisis” that exists in the city. The city council, like several other local governments, recently declared a homeless shelter crisis. It is something. Better than nothing. Might not be the right approach. But just letting this go on and on, our whole community loses. The effort by the City of Paso Robles to clear out the riverbed is just a colossal waste of employee time and money. If people want to remain and be washed away, let them be. We don’t need more nanny state helpfulness. PRPD would do more for the community by rounding up druggies and burglars. Can’t speak to burglary, but by rounding up the homeless they are certainly nabbing lots of druggies, the myth of them being great citizens who are temporarily down on thei luck notwithstanding. Paso Robles police have begun arresting homeless individuals who are not complying with the city’s order to evacuate their encampments along the Salinas River. it is too dangerous for the homeless to be living in the area, and the city has a zero-tolerance stance on riverbed encampments. Free room and board till the cold weather pass. Zero tolerance? There are encampments all over that river bottom and have been for years. Please, don’t allow your imagination to rule what you write. Spot on with your scripture references Ted, but easy with the finger pointing and shaming. Not everyone who helps out Does so under the name of their church or acknowledges what church they are affiliated with or even that they are affiliated with a church. My Bible tells me I am Gods church, what I do gives Him glory and not a church; he does also say when you give in secret you are openly rewarded by Him. When every church member, I repeat, every church member helps out 24-7-365, then and only then, will they start to become true Christians relative to helping the homeless. Obviously there’re a lot of pseudo-christians that don’t want to be perfect in the eyes of Jesus, nor gain treasures in Heaven. Jesus answered, “If you want to be perfect, go, sell your possessions and give to the poor, and you will have treasure in heaven. Then come, follow me.” (Matthew 19:21) Barring you, do you know of any Christian that has followed this path stated by Jesus the Christ? “And Jesus answered him, saying, It is written, That man shall not live by bread alone, but by every word of God.” (Luke 4:4 KJV) EVERY WORD within the bible, and relative to the topic at hand, in helping the homeless, not part time, but full time, is to be followed. Always preface your statements with, WWJD, then you arrive at a clear godly picture. I am accountible for my actions and have been commanded not to judge others. Jesus is the judge of everyone: He says that everyone who acepts Him as our risen Savior and Lord is the righteousness of God. Only God can know the hidden motives of the heart. Seek the Lord’s will for yourself and leave the rest of us alone to follow God as He leads us. I pray what appears to be extreme self righteousness on your part doesn’t cause you undue agony. If we get a big enough storm the problem might solve itself…KIDDING, KIDDING! It probably is true that the County Jail is a safer place for them. If they’re mentally ill, they can get their medications. If they’re addicts, they’ll dry out. County conservatorships on them and place them in a long term facility where they get treatment. Convict them enough times to put them in an Honor Jail program or at least a year where they can get treatment. Build a camp of Tiny Houses and provide trash disposal and security guard services. Take your pick County Lawmakers, just do something. Why not take falling apart former military bases like camp roberts on the 101, places that have infrastructure in place that could be upgraded, bus the homeless up there, have them participate in the labor to build the houses, have them plant gardens and build a community. Will never happen as long as society permits people to do nothing but take and have no stake in their own lives. I believe you mean well, but Camp Roberts is not a “…former military base…” it is actually in use all the time. I train up there several times a year. The base sees troops from all over the U.S. and even the Territories; I’ve spoken with Guam National Guard and Virgin Islands National Guard troops up there. Roberts also has foreign troops training there, particularly from the U.K.. The oldest buildings have been torn down, the others fill up with troops, especially during the summer Annual Training cycle when up to 9000+ soldiers can be there. It’s just not the place for a homeless shelter. There’s no hospital, only a basic clinic which isn’t staffed full-time. There are heavy vehicles up to and including tracked vehicles moving around. The water supply is limited. A better choice would be the old CYA Youth Camp in Paso, which would be more easily set up as a facility that could handle the needs of the homeless. A military base needs to just be a military base. Honestly, with all the budget cuts we have enough on our hands just trying to stay mission-capable; we can’t be babysitters for the homeless. Please, don’t push this idea down the Guard’s throat. We are hurting enough already. Thanks. thanks for your clarification…and for your service. “If they’re addicts, they’ll dry out”, why is it you think this? because if they are in jail they can not get drugs? Think again, I have a correctional officer friend who tells me drugs are rampant in the jail and prison system. Sometimes brought in my visitors but often brought in by correctional officers and others who are not searched, they do so to make extra cash and you are told not to say anything otherwise they know people who will silence you. What is continually missing from the riverbed of the Salina’s River in Paso Robles? Can you figure it out? Yes, what is missing on a 24-7-365 basis is representatives from the following nineteen Christian churches that find their homes in Paso Robles! There is nothing worse than followers of Jesus Christ in being outright hypocrites to His word, as they mingle amongst other like-minded hypocrites in church on Sunday mornings. When leaving church in their expensive Detroit Iron, and worrying about if little Johnny is going to be late for his soccer lessons, the homeless that reside along the Salina’s River are in need of some actual Christian bible help. WWJD? Can you spell h-y-p-o-c-r-i-t-e-s? Sure you can. Shameful and disgusting in the name of Christ! My godly Christian posts always gets more thumbs down than up, because of the simple fact that the thumbs down are from non-christians and Atheists that can’t accept our bible truth. The thumbs up crowd are from true Christians, because how can they vote otherwise if they read from the same bible that I do? In other words, they can’t vote thumbs down against the Hebrew Christian God’s inspired word. The lady who founded and still operates the People’s Kitchen in Paso attends St Rose as well as the founder and director of Paso Cares…St Rose again. The people that give their time and money, many from that same church. If your wrong about your list above on St Rose, what else are you wrong about? I am not wrong if any of the said churches are not helping the poor 24-7-365! Helping the homeless is not a “part time” situation when they’re in need 24 hours a day. When was the last time an assumed Christian from Saint Rose went down to these river encampments to actually help the homeless like Jesus so states? When was the last time a Christian from Saint Rose gave up all of their possessions and gave to the poor as specifically stated by Jesus Christ in Matthew 19:21? Do you hear the same “crickets” that I do? If one is going to use Christianity as a social club only, then admit to this fact upfront, but don’t become a hypocrite when postulating that you’re a true Christian when you don’t follow ALL of the teachings within the scriptures, period. Ted do you even know how to rightly divide the Word of God; or do you just think you can interpret any way you want to in order to be holier than the rest of us. Get a clue, you have missed the boat on this one. Cross reference Acts about Matthew 19:21. None, (not even you) are perfect; God says “All have sinned and fall short of His glory”. They want a free place to stay with meals and shelter, they’ll never pay fines sounds like a plan if I was in their shoes.